Product #15581 | SKU DTP Beat Kit 6 | 0.0 (no ratings yet) Thanks for your rating! 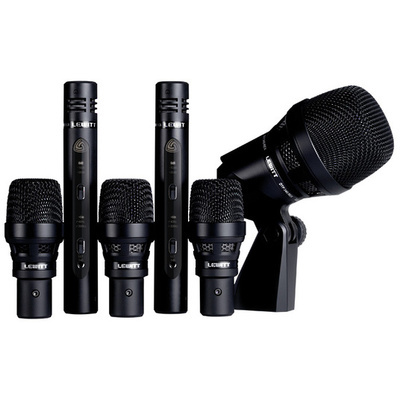 The DTP Beat Kit 6 is a conveniently packaged start-up selection of dynamic and condenser drum and percussion microphones and mounts, designed to offer performers and audio engineers of all experience levels everything needed for expert live sound reinforcement, home recording and studio recording. The 6-piece drum kit includes one DTP 340 REX and three DTP 340 TT super-cardioid dynamic drum mics, two LCT 140 condenser mics, windshields and drum- and shock mounting systems, and comes in a convenient black aluminium carrying case. Thanks to carefully tailored frequency responses optimized for drum and percussion applications, as well as precision dynamic capsules and uniform directional pickup patterns ensuring high gain before feedback, the DTP 340 REX and the DTP 340 TT deliver fine-tuned drum sound with extraordinary detail and impact onstage and in the studio. LEWITT’s highly versatile and compact condenser all-rounder, the LCT 140, allows for accurate and clear sound capture of cymbals. Its transformerless design makes it immune to electromagnetic interference, and convenient LED displays and recessed slide switches make it a perfect fit for live applications. The complete kit comes in a rugged aluminium case which allows for easy travel and secure storage.